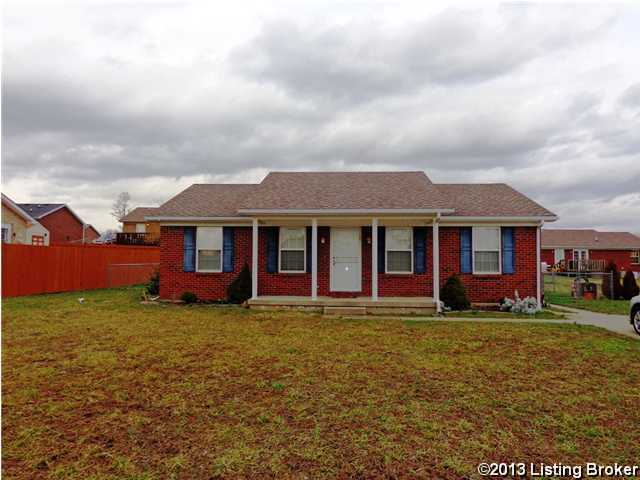 Lets schedule a tour of this great three bedroom brick ranch in Big Springs Subdivision. Spacious & Inviting Living Room with laminate wood flooring. Eat in Kitchen features lots of nice cabinetry and comes equipped with dishwasher and range/oven. 1080 sq. ft. of comfortable living space. Nice rear deck for outdoor enjoyment & outbuilding for additional storage. Call today for your personal tour of this great home in the country. Direction: Hwy 605 to American Dr turn right on Thunder Springs Dr.
Big Springs is a subdivision within the city of Bardstown, Kentucky. There are currently 0 Homes for Sale within Big Springs, with asking prices ranging from $0 to $0. The average list price per square foot of the available inventory in Big Springs is $0, which is the Bardstown average of $126. The Average Sales price of all sold real estate in this subdivision for the past year is $135,440. Recent comparable homes have been selling for 99.51% of their asking price. Waterfront homes represent of the available Big Springs inventory. The population of Bardstown, according to the 2010 Census, is 11,700. The total number of households in the zip code of Big Springs is 11,084, with an average household size for of 2.52 people. The total number of renter households within the zip code of 40004 is 3,084, which means that 72.18% of households in this zipcode are owner occupant households. 108 Thunder Springs Dr, Bardstown KY 40004 is a Home, with 3 bedrooms which is recently sold, it has 1,080 sqft, 0 sized lot, and No Garage parking. A comparable Other, has bedrooms and 0 baths, it was built in and is located at and for sale by its owner at $ 0. This home is located in the city of , in zip code , this County Other, it is in the Subdivision, and Edgewood are nearby neighborhoods.